This image is a combination of three photographs snapped by NASA's Juno mission on Feb. 12, 2019. 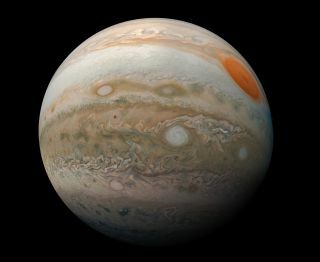 The image is stunning in its near complete-disk image of Jupiter, particularly highlighting its southern hemisphere. It also shows off the massive storm known as the Great Red Spot, the most distinctive feature of that hemisphere. The $1.1 billion Juno mission, which launched in August 2011, carries a camera known as JunoCam. But unlike the cameras on many NASA missions, JunoCam isn't part of the mission's science package. Instead, its goal is to bring the mission to the public. To that end, all its imagery, including this photograph, is processed by volunteer space fans, who bring a new depth to the data.